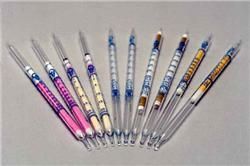 Gastec 211H Sulfide Ion (Solution Tube) Detector Tubes. Detection Range: 10-1000 ppm. 10 measuring tubes per box.